Antique rings can be precious engagement rings. If a couple does not have an heirloom ring or cannot find a design they like at a pawn shop or estate dealer, they can investigate different antique style diamond rings that draw influence from different eras and cultures. There are many antique and vintage-influenced rings available in a wide range of beautiful designs. Click on any of the following rings for direct retail information. Many modern rings take their influence from a variety of vintage designs, such as geometric patterns from Art Deco rings or filigree designs from Victorian rings. Using semi precious gemstones is also popular in these antique-inspired rings, though it is important that the touch of color does not distract from the ring's overall design. Victorian style rings are typically delicate and more simple than other antique designs. Filigree patterns, pave settings, and thin bands are popular with Victorian styles, and many of them will include floral or vine patterns. Art deco engagement rings feature lavish, bold designs with clear geometry and stark lines. Different colors of gold set off the unique shape of the setting, and it is not uncommon for the diamonds to be secondary to the overall bold shape of the ring. Art deco diamond rings do not always have a center stone. Instead, the geometric patterns of the ring stand out as the most important feature, and these types of rings are not only great for engagement rings, but are also ideal for women's right hand rings. 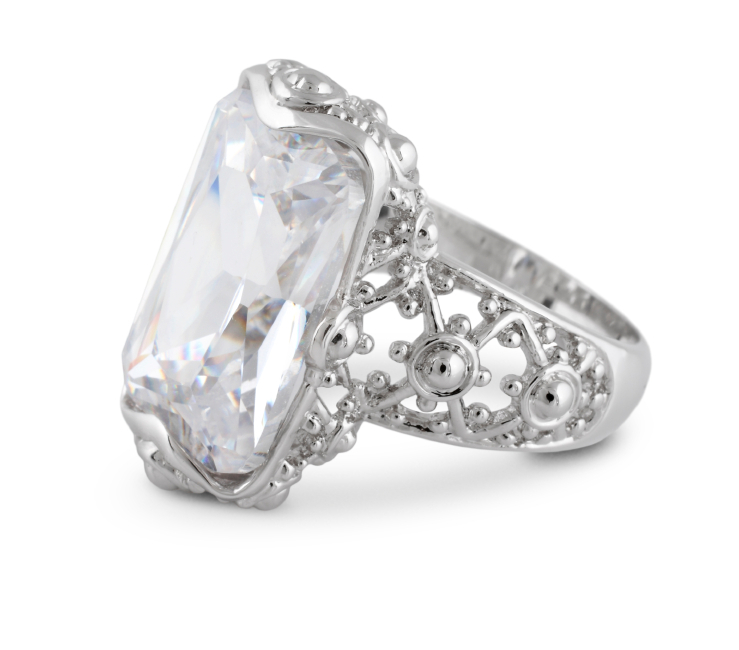 Edwardian diamond rings often feature somewhat elaborate settings paired with a single center stone. The settings may include geometric patterns and filigree designs, and colored diamonds or semi precious gemstones can set off the style even more. Old European diamond rings are vintage-inspired with relatively large, bulky designs that include layers of gems in different shapes and patterns. While suitable as women's rings, these larger rings are more often favored as men's engagement or wedding rings. Celebrity-inspired rings can often have antique style influences, such as Marilyn Monroe's distinctive baguette eternity ring. Because celebrities often influence fashion, including jewelry fashion, the trendy styles a celebrity wore decades ago have a classy, smart design for the vintage-inspired styles of today. The most popular antique ring style of all, and one that has never gone out of style, is the diamond solitaire. Available in a wide range of sizes, shapes, and designs, the simplicity and beauty of this classic ring design is always popular and timeless.